have you seen some (renaissance) sculptures? it’s beautiful, isn’t it? then, think how the artists made all those beautiful sculptures at that time. some of them, probably made their masterpieces based on their imagination, or from artistic drawing (just like michelangelo created the famous ‘david’), or with models. being the housemate of an art school student giving me a lot of experiences; not only knowing some aspects of art, but also being a model for one of her masterpieces. it was started when i made a joke to her about making the sculpture of my head. surprisingly, she said yes. and the next days, what i knew, all the materials were set up and ready. well, it’s not a joke then. and.. who said being a model, in particular the sculpture model, is an easy job? in the first session, i had to stay in my position for about 2 hours. even though it was a ‘relax’ position, freezing for two hours was not easy (in particular for me). she is also a professional one. 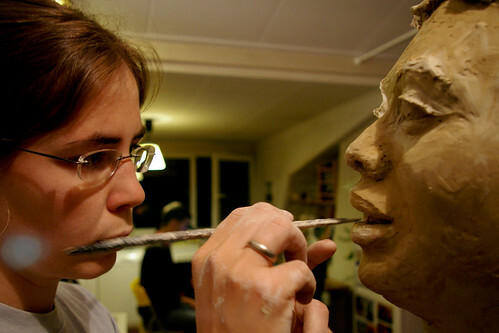 a few seconds after she touched the clay, at a sudden she transformed into another person. the serious one. she also reminds me one of tv star in HEROES, isaac mendez. later, in the second session, she found out that my serious look doesn’t show the ‘real’ me (eh? really? ), and she asked me to smile a bit. it means a big grin for me. thus, for the next two hours i had to keep my face looks happy. now, it’s time to finalize. she has to put plaster material all over ‘my head’ and later, create the real sculpture. however, we have to wait until she can find a better material for this. the plaster we found in holland was not a good enough, according to her experience. elisabeth westbrock, my housemate, is an art school student of burg giebichenstein hochschule für kunst und design in halle, germany. her major is glass art, but she is also great in drawing and making sculpture. she loves some masterpieces from chillida, barlach, and rodin. ask her about art, and she will explain you the beauty (and also the confusing aspects) of it. for her thesis, now she’s trying to find out the ‘meaning’ of idealism. not only in art but also in other aspect of life. interested? The sculpture beats the original, doesn’t it? No, really, it is terrific. You are lucky to have this house-mate. Btw: enjoy your visit home. A lot.